As a newly minted parent to a sweet, little girl, I’ve got something to say to all of the other parents I know. While I got a ton of often unsolicited advice from family/my hairdresser/random strangers, I wish that someone had sat me down and said, “You’re baby is going to do some totally weird stuff. But, it’s ok – don’t freak out!” No one tells you that this little baby you’re bringing into the world will probably be the strangest person who’ve ever met. I’m here to tell you all about it! 1. They pass gas…a lot. I guess I knew that babies pass gas. I mean, of course they do. What I didn’t realize was how often and how loud said flatulence would be! Suffice to say that, between my husband and I, there have been a lot of “It wasn’t me”-s. Bonus – if you have the sense of humor of a 10 year old boy (like my husband and I), this trait makes for some serious giggles! Snorts, grunts, squeaks – your baby will do it all. They’re noisy little beasties, even when sleeping – you’ll be jolted awake by random noises coming from the baby monitor, trust me! 3. They don’t have perfect skin. You know how people talk about the intoxicating feel and smell of a new baby? Ok, not total lies, but your baby’s skin is probably going to be a little funky for a while. He or she may have some skin discoloration (like red birthmarks that gradually fade called stork bites or angel kisses – my baby had both), patches of flaky skin (like eczema or cradle cap), blotchy skin (from their still-maturing circulatory system), and even bruises (from the pushing stage of labor or if a vacuum was used during a vaginal birth). You’ll still want to kiss them all over though, trust me! 4. They have weird poop. I knew baby poop was different from adult poop, but I didn’t realize how different it was. Normal baby poop can come in a vast variety of colors, though it should always be pretty soft (which makes it difficult to discern when your baby has diarrhea). My baby girl has been on this earth for 1 month and has already graced us with several different colors and textures! Your baby’s poop can be a great indicator of overall health, so if you have any concerns about your baby’s stool, always give your pediatrician a ring! The first time my daughter sneezed, I almost died from the cuteness overload – she even does the “double sneeze” like her dad! But, after several sneezing bouts, I began to worry that something was wrong – was she sick? My pediatrician explained that sneezing is no biggie and can be totally normal. So, unless they are showing signs of illness, it is nothing to worry about. So, now, I just enjoy her funny sneeze faces! 6. After a vaginal birth, they really can have a crazy conehead. I had heard about babies having coneheads, but I didn’t know just how pronounced they could be! After an hour of pushing to welcome my daughter to the world, her head looked downright alien. Plus, she had a HUGE bruise on her noggin to boot. Luckily, those cute hats they put on them hide just how insane their little heads look. You will be amazed how quickly it goes back to normal, so take heart if your baby starts out looking like something from a sci-fi movie. 7. They’re hairy – even if they don’t have much on their head. Babies come into the world with different amounts of hair – from the baldies to the ones who look like they could star in a shampoo commercial. Even so, you may be more intrigued by hair elsewhere. I noticed patches of in weird places on my daughter, like her upper arms. 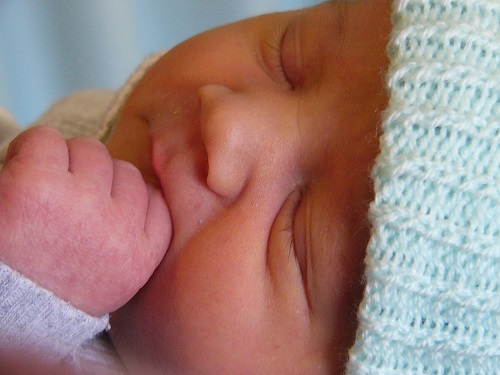 It’s called lanugo – it is a covering of downy-like hair that your baby develops in utero. Except, sometimes, it hasn’t all gone away by the time they enter the world. Oh, and if your little one is born with luscious locks, don’t get too attached – much of it may fall out! This is totally normal. 8. Baby girls can have a mini period. I didn’t encounter this one first hand (thank God). But, my pediatrician warned me that my baby girl may have a “mini period” because of my hormones roaming around in her body. I’m glad she warned me, since I probably would have lost it if I had experienced this without being prepared for it! But, seriously, how weird is this? Pregnancy hormones are crazy. 9. They do truly cry for no reason. You’ve gone down the checklist. Fed? Check. Clean diaper? Check. No gas? Check. Comfortable temperature? Check. So, your baby should be happily cooing in your arms, right? If only babies were this logical. Sometimes, your baby is going to cry and you simply won’t know why. It could be something they can’t express to you (apparently hair wrapped around toes is a common baby complaint that moms just don’t think of). But, it could also be that they are simply crying. And, all those soothing techniques you learned on YouTube? Sometimes they work, and sometimes they don’t. My best advice on this is try to soothe as best you can, and put your baby down if you’re starting to feel frustrated. Once you have calmed down, come back to your baby. Contrary to what some parents say, your baby won’t cry ALL the time (it just may seem like it!). And, you will have those glorious moments of alertness without crying, I promise! 10. Once you think you have them figured out, they throw you a curve ball. Once you think you have it all figured out (how naive of us! ), they will do something totally out of the ordinary and you’ll be back to square one. Maybe your baby did well with a certain bottle brand, and is now refusing to eat. Maybe he used to love the swing, and now hates it. Maybe she develops a diaper rash even though you are religiously using diaper cream with every change. Just roll with the punches – your baby is rapidly changing and his preferences will change too!